We describe the setup and functionality of Azure RemoteApp for providing Windows applications as a cloud service. Microsoft uses the in-house Remote Desktop Services with Azure RemoteApp to provide Windows applications as a cloud service. It supports both Microsoft Office and applications of your choice that are compatible with Terminal Server. In this workshop, we show you what options are provided by the apps from the cloud and how to set them up with ease. Terminal Server has been well known for a long time, but although it has become significantly easier to handle, many administrators still keep clear because, they argue, the technology and the licensing model are too complicated. Microsoft is now using the technology in the form of Azure RemoteApp  to host applications as software-as-a-service. The complexity of the required infrastructure remains largely hidden from users and administrators. I'll take a look at the range of functions before addressing the specific setup. The technical basis is the Remote Desktop Session Host role service from Windows Server 2012 R2. Users access the applications in the cloud via Microsoft's Remote Desktop Protocol (RDP). All operating systems for which Microsoft offers RDP clients therefore come into play on the end devices. This applies to Apple's iOS and Mac OS X, as well as for Android, and of course various versions of Windows. In addition to Windows 7 and 8.x, Windows RT, Phone, ThinPC, and multiple versions of Windows Embedded for thin clients are included. Microsoft offers cloud and hybrid deployments on the server side. The former include terminal servers that run independently in the cloud. You can log in using Microsoft accounts or using your own Active Directory accounts, if you pair it with the cloud using Azure AD. The typical use is a ready-made image from Microsoft using Office Professional Plus 2013. Neither the users nor the administrators have to worry about the back end. Microsoft takes over operation, patch management, and infrastructure safeguarding. You can also create your own Windows Server 2012 R2 image and upload it to the Azure cloud. You can then install and operate all applications that are suitable for a Remote Desktop Session Host yourself. In this case, however, you do have to look after the patch management for both the operating system and the applications. A hybrid deployment is recommended for this approach. Because you establish a VPN connection to your local infrastructure with the Azure cloud in hybrid mode, you can integrate the Terminal Server in the cloud into your local Active Directory domain and thus also supply your own group policies. You can also use file and application servers directly in your local network in this way. You can decide which of the two operating models you want to use when you create a new RemoteApp collection. A collection is a logical grouping of applications for a specific group of users. Microsoft takes care of scaling the Remote Desktop Session Host for both operating models. You do not have to worry about how many processors or gigabytes of main memory the Terminal Servers are equipped with. In fact, you can neither influence nor see the specific server features in the Azure front end. You only have the choice between two performance categories, which Microsoft calls plans. A user has 50GB of persistent storage on the server side for both plans. According to Microsoft, the "Basic" plan is targeted primarily at office staff with lower performance demands, and the "Standard" plan focuses on users with higher requirements. Microsoft sadly does not reveal any more about the technical background, meaning a test is needed. If it turns out that the performance of a RemoteApp collection is too low in the Basic plan, you can simply switch to the Standard plan via the Azure front end and back again. You can currently create only two app collections. As soon as you try to generate a third, the front end suggests you contact support if you need further collections. The same applies to the maximum number of users. In the Basic plan, you can assign a maximum of 400 users to a collection; the limit is 250 in the Standard plan. Here, too, Microsoft points you toward support if you want to exceed the maximum limit. You will need a Microsoft account for a trial. To do this, sign up for a free 30-day trial of Azure . The next step is to specify a phone number that Microsoft verifies by calling or sending a code via text message (Figure 1). Even though the test is free, you still need to specify a credit card at this point. You can then use the Azure front end. 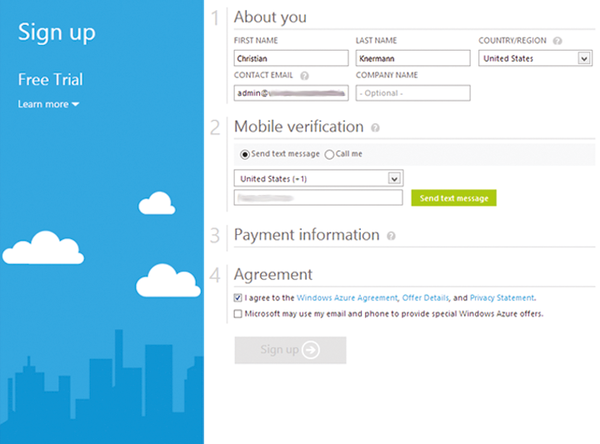 Figure 1: A free trial of Azure RemoteApp requires a credit card a phone number. Azure Stack is an Azure extension that implements an on-premises data center for consistent hybrid cloud deployments. When it comes to merging the cloud with local resources, Azure offers some useful automation tools. Once you start putting services in Azure cloud, you might want to add an Active Directory domain controller. Microsoft continues to integrate Windows Server with the Azure cloud. With Cloud Witness and the RDS Connection Broker, you can operate distributed environments more reliably and efficiently, and SQL databases migrate sensibly into the cloud.